You’ve Got Another Thing Comin by Judas Priest. It was originally released on their 1982 album Screaming for Vengeance and released as a single later that year. 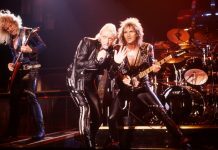 It became one of Judas Priest’s signature songs along with “Electric Eye” and “Breaking the Law”, and a staple of the band’s live performances. “You’ve Got Another Thing Comin” was first performed on the opening concert of the Vengeance World Tour at the Stabler Center in Bethlehem, Pennsylvania, on 26 August 1982 and had been played a total of 673 times through the 2012 Epitaph Tour. In May 2006, VH1 ranked it fifth on their list of the 40 Greatest Metal Songs. The song reached No. 67 on the Billboard Hot 100 charts, making it Judas Priest’s only charting song in the United States. The song is written in the key of F-sharp minor. The intro that i play is a combination of the 2 parts recorded by KK Downing and Glen Tipton. The original track has Gen Tipton just playing power chords over the rhythm played by KK Downing. I have included the tabs for both guitars on my website and can be obtained by clicking n the link below. 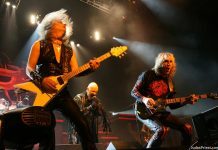 You can find Judas Priest lessons in my playlist and on my website by clicking on this link.